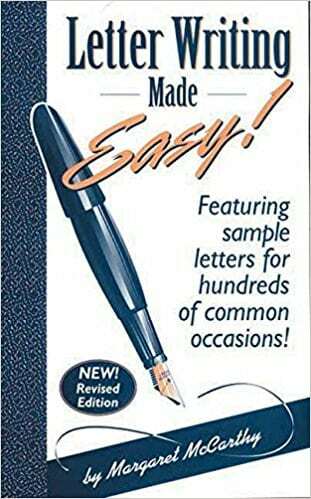 Letter Writing Made Easy! Featuring sample letters for hundreds of common occasions! Volumes of ready-made letters are a venerable tradition. They were favourites of the Victorians, and their enduring popularity stems from that indestructible body of people who know what they want to say but don’t know how to say it. Margaret McCarthy’s two volumes of templates are no better or worse than many of their type, and, with minor adjustments for technology and changing mores, would have been usable in the days of, say, Grover Cleveland. Subjects like “School bully needs to be stopped” and “Protesting service charges” are perennial. McCarthy changes with the times sufficiently to include form letters to cover “Goodbye to Ex-Significant Other’s Family” and “`Coming Out’ for Family and Friends” (“You are very special to me, and now that I know how brave you are, I value you even more.”) On the other hand, there is nothing about e-mail communication or about the niceties of Netiquette: If you capitalize everything, YOU’RE SHOUTING. From howdy to rowdy, it’s all there.